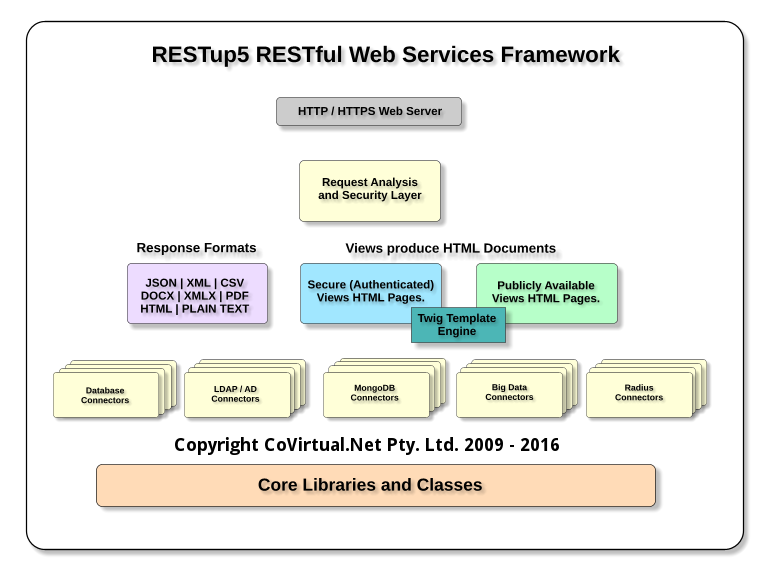 The RESTup5 RESTful Web Applications Framework, developed by CoVirtual.Net in Australia, facilitates rapid development of both Web Sites and Systems applications, via a RESTful web services interface, with connectors available for popular Relational and NO-SQL Databases, LDAP Directory Services, CSV, TSV, JSON and XML data structures. Ability to deny / allow hosts and users on a per page / REST method basis. Per Page protocols may be specified ( http | https | soon ws and wss for IoT ). Per Page (overrideable) default response type (JSON | XML | PLAIN TEXT). Bootstrap 3, Angular.JS and jQuery incorporated to facilitate rapid frontend application development. New pages may be deployed to your site in seconds. Supports multiple concurrent connections to different data sources. We have chosen to license RESTup4 & RESTup5 under the LGPL (Limited General Public License) and will soon make the GA version available here. Data Migration, ETL/ELT and Cleansing. Business Intelligence & Data Warehouses. Data, Software and Systems Development. Cloud, Hosted and On-site Computer Systems and Support.